The ES-450 J VTR Controller has been designed to give the optimum ease of use, with great care being given to the ergonomics of key layout. The jog/shuttle control is JLCooper’s much loved device that gives instant access to both jog and shuttle functions without any other push or switch operation. A control that is ultra fast and effective to use and a natural partner for the intuitive ergonomics of the ES-450 J. Located above the centrally placed jog/shuttle control, so they fall immediately under the fingertips, are the five primary transport keys. Significantly, these include a REVERSE play function. Immediately surrounding the jog/shuttle control are seven edit keys for locating and marking edit in/out points. Hence all the most frequently used operations fall naturally to hand, making the ES-450 J fast, efficient and a pleasure to use. 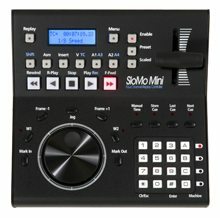 The edit preset keys for selecting the type of edit or record functions are located above the transport controls and beneath the LCD display, which shows the timecode location of the connected recorder and its current status. Completing the keyset on the ES-450 J is the GOTO key that turns the transport and edit-preset keys into a 0-9 keypad for entering the location to which the connected machine is to be targeted. 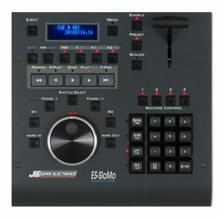 ES-450 J4 with 4 channels for 4 machine control. 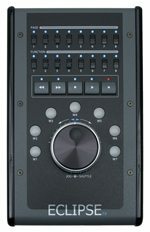 ES- 450 J2 with 2 channels for 2 machine control. 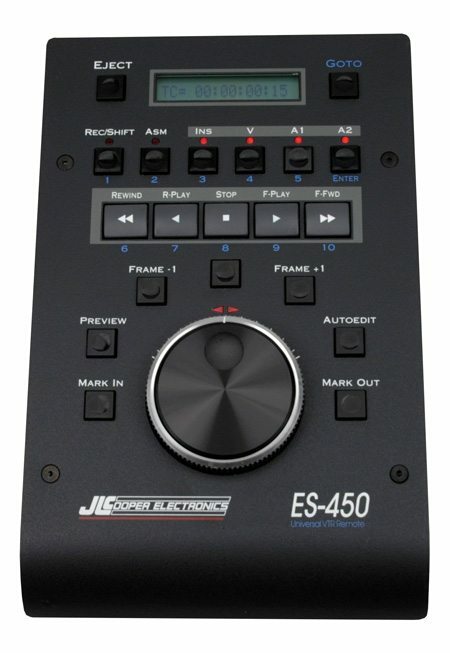 ES-450 Je as ES-450 J with Ethernet interface.